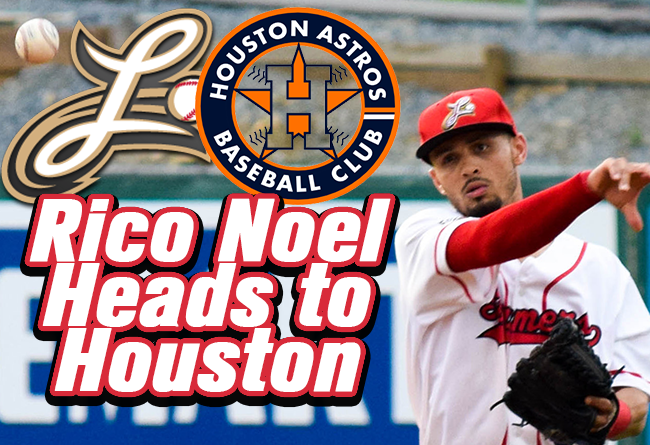 (Lancaster, Pa., August 2, 2017) - Second baseman/outfielder Rico Noel has had his contract purchased by the Houston Astros, it was announced today. Noel becomes the 11th Barnstormer in 2017 to head back to a Major League organization, a franchise record. His destination within the Astros organization will be announced later in the week. The speedster took the Atlantic League lead in stolen bases in his final game with the Barnstormers on Monday evening, passing former teammate Darian Sandford with his 34th on a steal of third base in the first inning. Sandford’s contract was purchased by the Washington Nationals in mid-June. Noel signed with the Barnstormers during the off-season but accepted an offer from Leon in the Mexican League prior to the start of the regular season. He returned to the Barnstormers on May 24 to fill in the second base slot left vacant when Jeff Kobernus headed to the Seattle Mariners organization. During his time with the Barnstormers, Noel hit .261 in 56 games. He had 12 doubles, a triple and two home runs. The former star at Coastal Carolina scored 42 runs for the Barnstormers and drove in 17. After spending five seasons in the San Diego system, Noel was acquired by the New York Yankees in 2015 and earned a September promotion to the Major Leagues that season. He appeared in 15 games, batting only twice. As a Yankee, he stole five bases.